During this time of year hundreds of school age children visit Como Park Zoo and Conservatory through out the week. It is a sight to see as bus after bus unloads in front of the Conservatory. Looking out the windows of the Visitor Center around 10 am you will be able to see this rainbow mob waiting to get into the zoo. When the doors open you can just feel the excitement of these groups as they walk by. If you are brave enough to go to the 11:30 am Sparky show you will get the full effect of the excitement at Como Zoo. As soon as Sparky enters the stage a thunder of applause and screams echo throughout the entire zoo. 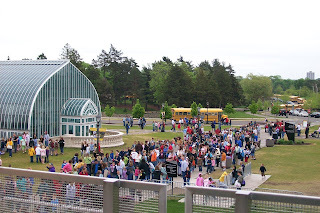 By 2 pm the buses are being loaded and the Zoo and Conservatory becomes quiet and peaceful while it waits in anticipation for tomorrows groups.